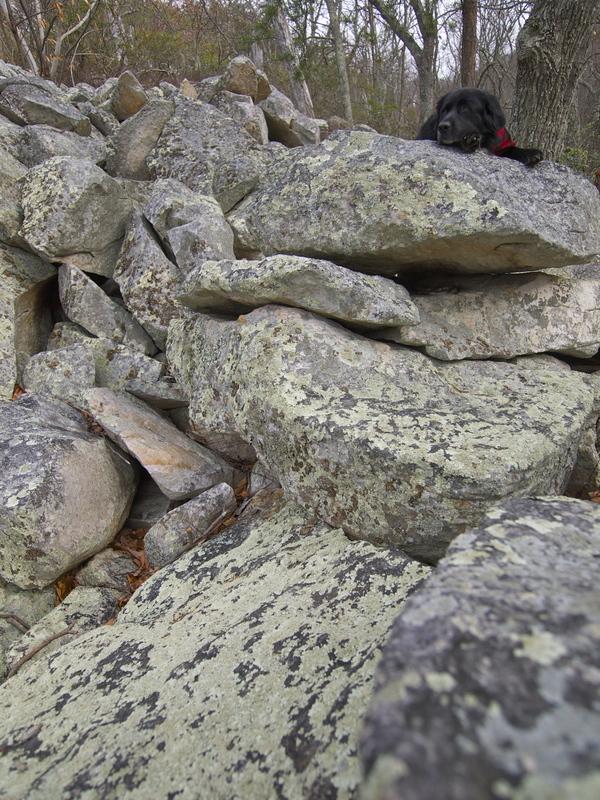 Last week, after hiking with Drew’s family to the Devil’s Marbleyard, when everybody headed back down the trail to their cars, Dio and I kept going up and over the mountain to meet up with the Appalachian Trail. 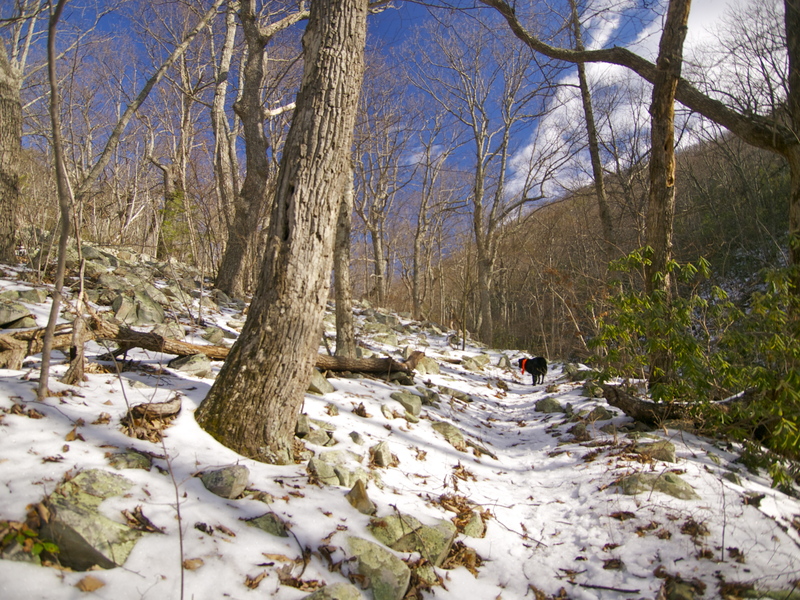 After an indulgent and crowded holiday season, we were both in need of a long, hard hike alone in the woods. 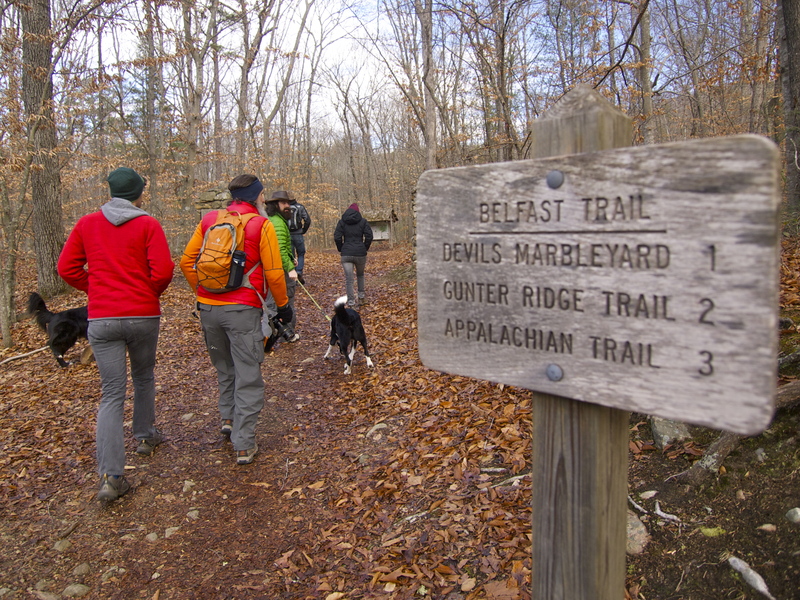 The Belfast Trail connects to the Appalachian Trail three miles up the mountain. Earlier in the day I had left my car at the James River crossing, planning on a 12 mile trek. Once a week I try to do a 10-plus mile day, to keep up my stamina, but I had skipped a couple of weeks over the holidays. 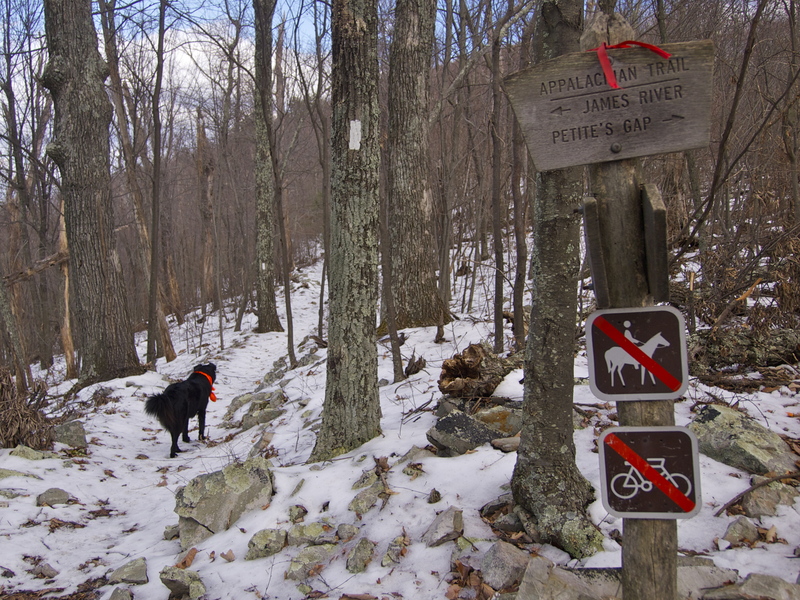 My last big trek had been December 15th – a 12-mile hike on the Balcony Falls Trail to the AT and I fully expected my legs and lungs to suffer a bit. My older dog Bowie doesn’t know he’s ten years old and he thinks he can still 10+ mile days. I usually cap him at 7 miles, otherwise he’s sore the next day. When we left the Marbleyard, Drew clipped a leash on Bowie and led him back down to the cars. I heard later that Bowie dragged his feet and looked back over his shoulder the whole way. He even slipped out of his collar a couple of times and tried to escape. I’m not sure which is worse: seeing him sore or breaking his ever loyal heart. Bowie sitting out the Marbleyard. Hiking alone with Dio, however, is a joy. He’s so obedient and earnest, I swear I could hike with that mutt off leash from one side of the country to the other. Obedience is probably the wrong word. I didn’t train Dio and rarely give any verbal commands. His pack instincts are strong and he reads body language like a canine savant. After hiking a few thousand miles together, he knows what to do: Dio won’t pass me unless I give him permission. He’ll stay on my heels all day long. If I wave him ahead, he stays in sight, waiting for me to catch up. If I stop, he stops. I don’t have to call him back, all I need to do is stop walking for a few beats and he’ll come right back. If he hears somebody ahead on the trail, he comes back. If he’s ahead and the trail forks, he waits. Dio taking a rare rest, waiting intently to see what we’re going to do next. For the most part, he doesn’t chase, but this has been the hardest lesson. He does occasionally go after squirrels and small game, but he has learned the hard way about chasing anything bigger than he. Just the other day, hiking in Harpers Ferry National Park in West Virginia, we happened upon half a dozen habitualized deer. Safe from hunters in the Park and apparently used to handouts, I had to wave my arms and shout to move the herd off the trail. Dio watched with rapt attention, but he didn’t go after them, even when they finally ran up their white flags and bounded away. Not bad for a formerly wild desert dog! Hiking uphill, my pace was slow and sore, the damaged disc between my shoulder blades a hot coal of pain. My back bothers me most days; to cope I compartmentalize. My disc hurts, but the rest of me feels fantastic. My calves are burning, but the rest of me is thrilled to be hiking this trail on this beautiful day. I visualize the pain in my legs sifting down to my feet and out my soles, leaving a trackable trail of fine particles in my wake. Step by step, I climb, feeling stronger with every step. There’s nothing I’d rather be doing, no place else I’d rather be but climbing this mountain. By the time I hit the ridgeline, my trail legs have seared through all weakness and rediscovered their muscle memory. I feel propelled, pulled onwards; I envision a rope tied around my waist, tugging me indefatigably, inexorably up the mountain. All I have to do is keep my feet. The trail along the ridge is icy and I should have traction devices and real boots instead of my trail runners, but I’m feeling sure and surefooted. Slipping here could mean serious injury; alone on a mountain, serious injury could mean serious trouble. But I won’t slip. I don’t slip. With the Sun on my right and the warm breeze from the river valley on my left, ice underfoot cannot chill my mood. On the way down off the ridge, following the AT down into the river valley, I’m cruising, nearly running, my downhill muscles strong and sure. Ahead of me, Dio pauses a moment to listen downslope and then trots back to my heels. Must be people ahead. Sure enough, on the next switchback I pass a grey-haired couple, also going downhill. They pull over to let me breeze by and we exchange smiles and pleasantries. “Be glad for your good knees,” he shouts to me as I fly. Amen! 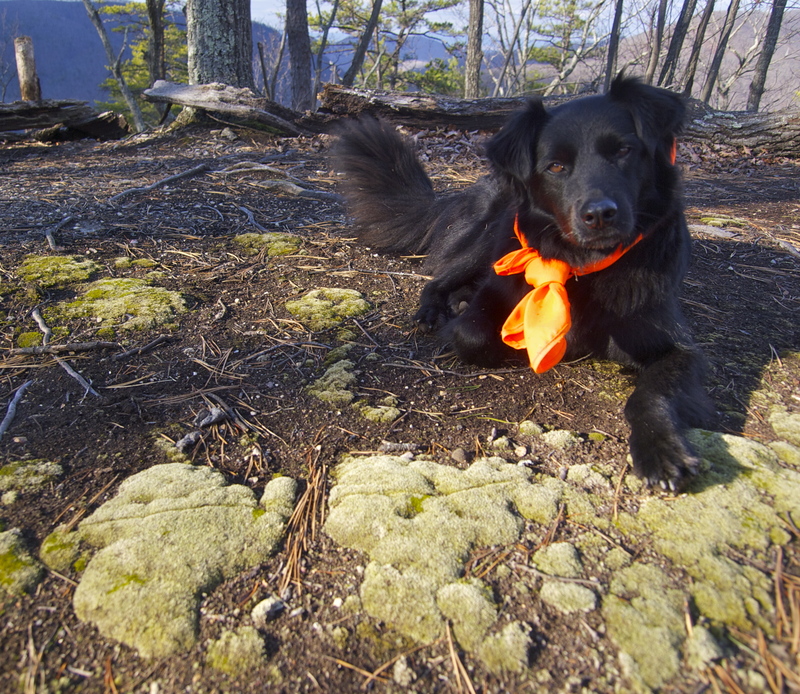 Dio drinking out of Matt’s Creek, which runs past the Matt’ Creek Appalachian Trail shelter. 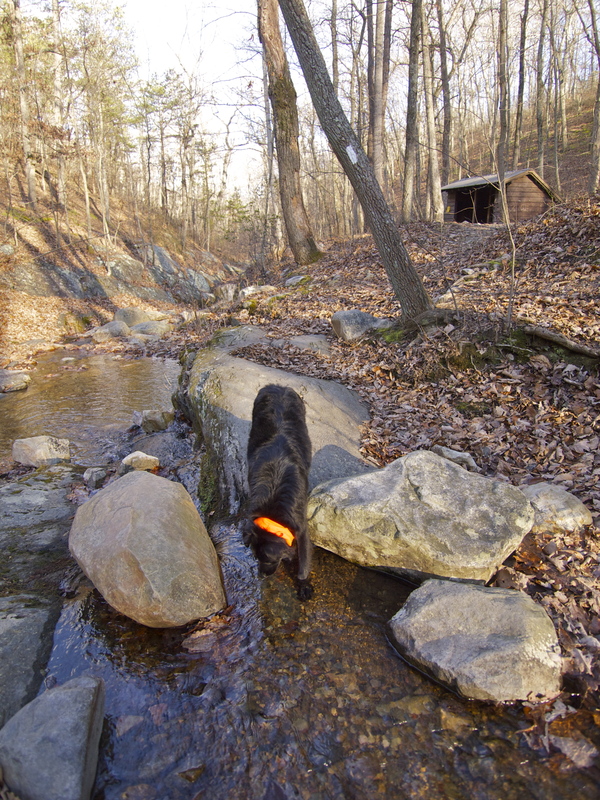 Finally, we hit the creek and Dio takes a long drink from the cold running water. I am jealous, as always, that I can’t do the same. From here we have an easy, rolling 2.5 miles back to the car. 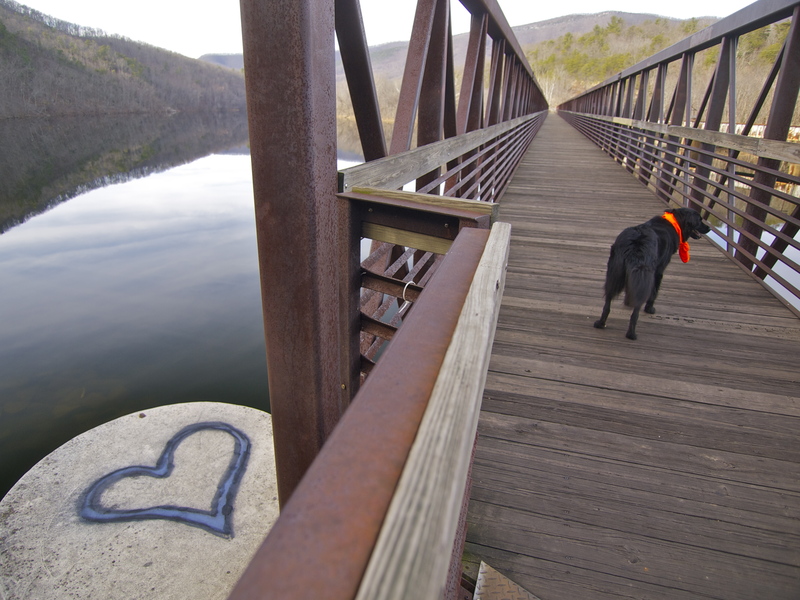 One last obstacle for Dio, however: the James River Foot Footbridge. No, that’s not a typo. It’s a footbridge named after William T. Foot. The Pedestrian-only James River Foot Footbridge on the left, the railroad bridge on the right. This was taken earlier this fall, when the leaves were first starting to change. 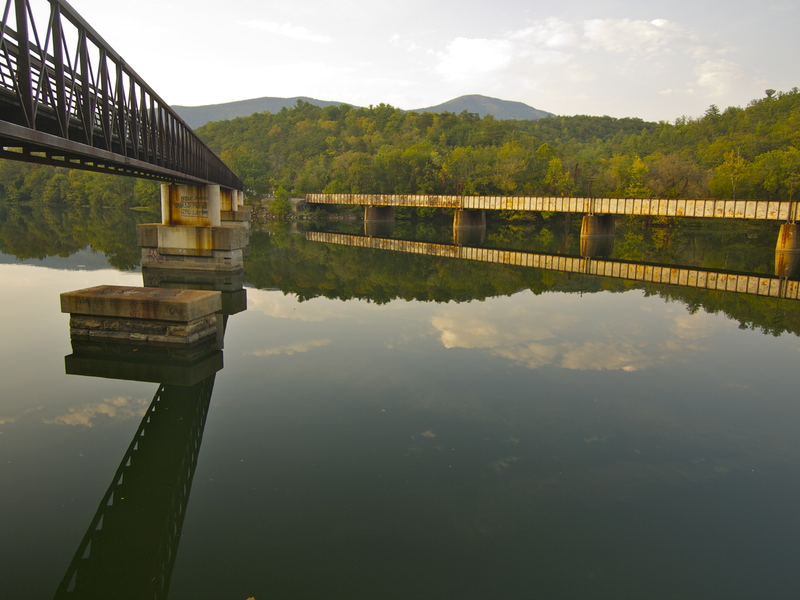 Beloved by me, dreaded by Dio, who has always been afraid of bridges, this isn’t just any footbridge, it’s the longest pedestrian-only footbridge on the Appalachian Trail. Dio trots up the wooden steps, sees what’s ahead and waits for me. I don’t try to coax or cajole him. I don’t want him to think crossing this bridge is something he needs to be talked into. I enthusiastically say, “Let’s go!” and he trots across, not behind me, but right beside me. No better way to finish a hike than stride for stride with a trusted trail ally! Stay tuned for a post on Harpers Ferry National Historical Park! Looks like a nice hike. It s hard when you have an older dog, isnt it? Hard to know how much to let them go. I am a hiker as well. Alltho I live in the sierras so more into skiing in winter. Last summer did a LOT of hiking with my dog pal Jasper. He is 11 or 12 . Not sure exactly. He is a rescue do. ausie/border collie mix so lots of energy. He can still hike 10 miles and still seems to enjoy it but I see him going slower then in the past and worry allready about how he will do next summer. He will be 12-13 then . Great post. Love that dog. Oh ! What fun you have with your lovely dogs Mary,and they are so obedient. As a matter of interest, I found some fossils today known as devils toenails real name “Gryphaea”,I expect you know of them.